A hot, relaxing place will soon be opening in Mihama! A little known fact about Mihama is that there is spring water buried below the white sands of Sunset Beach. There’s a hot spring in Mihama, and it’s now becoming part of another attraction called ChuLa-U. In June 2003 natural, high-quality hot spring water was found beneath Sunset Beach, and ChuLa-U is the result of this discovery. Located right in front of Sunset Beach in Mihama, ChuLa-U opens on May 1st with all the amenities possible at such a facility. 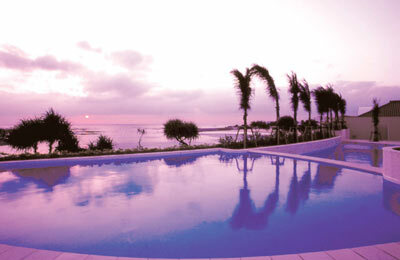 It’s outdoor healing pool uses spring water and doubles as a swimming pool, something that cannot be found anywhere else in Okinawa. There are two other pools, a shallow one for children and another at normal depth. Its outstanding location allows guests to come and go from the adjoining Sunset Beach. A low-temperature sauna is also available. There is a bathhouse where men and women bathe separately. In addition, you can relieve your thirst at the juice bar and dine at the adjacent restaurant. One key feature is that the bathhouse consists of both indoor and open-air baths. The indoor bath uses regular tap water and provides a place where you can cleanse yourself, using the shampoo supplied. The open air baths use hot spring water that constantly flows through without being recycled. The spring water has beneficial effects on muscle and joint pain, sensitivity to cold, fatigue and so on. There are common rules for bathing at ChuLaU. Everyone has to undress completely when bathing, but swimming suits are needed for outdoor pools and saunas. Individuals with tattoos will not be admitted. Swimming suits and towels are available for rent at the front desk. Entrance fees are adults ¥1,300, children ¥700 and infants ¥300. An extra ¥500 for adults and ¥200 for children will be charged on weekends and Japanese national holidays. The outdoor pools are open 10:00 a.m.–10:00 p.m.; bathhouse hours are 6:00 a.m.–11:00 p.m.; and the restaurant operates 11:00 a.m.–10:00 p.m.